Sanders, who, on previous occasions when asked, has had little to say about the topic, had a lot to say to the rally participants. Introducing policies that create opportunities for employing people with disabilities is not a conservative issue or liberal issue; it is a human issue, and it affects a large portion of the electorate in the United States. The top issue in the disability community is jobs. Government policies that help people with disabilities get and keep jobs are a win-win because they allow people with disabilities the dignity and financial benefits of work and also grow our economy and save taxpayer money. Sanders also called for expanded opportunities for people with disabilities including educational and housing options. “In the year 2015, we have got to expand, not cut, educational opportunities, by fully funding the IDEA [Individuals with Disabilities Education Act], and vocational programs for Americans with Disabilities,” Sanders said to cheers. 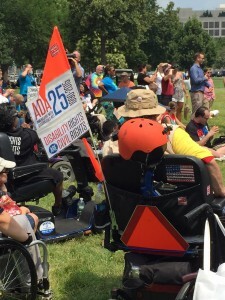 America has 56 million people with disabilities, more than 20 million of whom are working age. More than 50 percent of Americans report having a family member or close friend with a disability. Thank you very much for coming out today, look I don’t have to explain to anybody that big money and trusts have enormous influence over what goes on in Washington. They make huge campaign contributions, they have lobbyists, and everyday they influence the legislation that gets passed or does not get passed. The only way that ordinary people get their needs heard, get their issues addressed is when they stand together. When they stand up and say enough is enough, the congress and the president need to listen to all of the people and not just wealthy special interests, and that is what your presence here today is about. So thank you very much for coming. A nation is judged, brothers and sisters not by how many millionaires and billionaires it has. It is drudged in terms of social justice (cheering). How it treats the most vulnerable people amongst us. How it treats the elderly that are sick. How it treats the children. And how it treats those with disabilities (cheering). And what we are saying loudly and clearly in this nation, the wealthiest nation in the history of the world, we are going to treat people with disabilities with dignity and respect. And we have got a long way to go, progress has been made, but we’ve got a long, long way to go. Furthermore, don’t let anyone tell you that the social security trust fund is going broke. All you know is that social security can pay out every benefit to every eligible American for the next 19 years. Our job is not just to protect social security benefits, it is to extend and expand social security benefits. (cheering)And the way we do that is to scrap our taxable income. It is absurd that people making millions of dollars a year are contributing the same amount into social security as somebody making a 118,000 a year. I have introduced legislation that lifts that cap. It would extend social security for decades and expand benefits for both the elderly and the disabled. That is the struggle for today, and when we have 45 million Americans living in poverty. When we have the highest rate of childhood poverty of any major country on earth, we know what our priorities must be and that is to take care of the people in need, not give tax breaks to people who have more than enough. Thank you so much for taking a stand and trying to help us. God bless you! I also would like to find out about raising the Social Security Disability monthly payment raised to 1000.00 per month (lowest pymt.) and up. Now the other is to have every single worker no matter what nationality PAY into it. We do not plan on becoming disabled. It happens an can happen to anyone anytime. I was bringing home 1200.00 a month-(bring home!) back in 2001 an 14 years later my disability payment is only 470.00 month…disgusting to say thd least. I wish wish wish there was a job I was able to do. Disabled lives matter…so many are not able to voice/fight this. Some are completely dependent on others. If I get the SSI pymt. because my income is low ..lol but no joke intended-(Im married so any income husband getsis supposed to count as ours-OURS???? BS-I am treated like *^&#$#/^-) anyway got off track, sorry. Disability needs to start the payments at no less then 1000.00 p.s. also when taxpayers die before ever receiving their disability payments, where does that money go? Don’t tell me funds aren’t available.